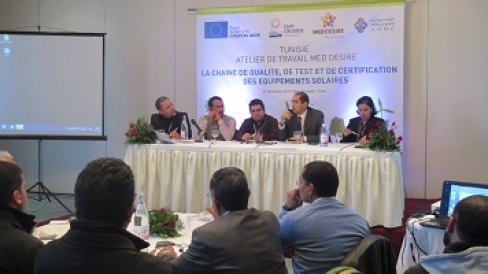 In the framework of MED-DESIRE project, the National Agency for Energy Conservation - ANME, organized on November 27th, 2015 in Acropol hotel les berges du lac - Tunis, a workshop on “The quality supply chain of solar energy: Certification and Qualification”. The event have seen the participation of 58 participants representatives of relevant public administrations active in the certification of solar energy equipments, accreditations of solar labs, promoting industries and in solar energy in general as well as private organisations, professionals, SMEs operating in the field of solar energy and associations. The workshop was opened by the General Director of ANME and then an introductory speech was given by the General Director of the solar PV testing lab CETIME and the General Director of the solar thermal testing lab CTMCCV. The event was structured into two sessions: during the first one, the General Director of the EU ENPI CBC programs within the Ministry of International cooperation explained the EU ENPI CBC program and the new ENI CBC opportunities, the ANME representative introduced the Tunisian energy context and new law of RE generation, whereas the MED-DESIRE expert gave an overview of the project and the WP5. Within the first session, national experts from national standardization body INNORPI, the solar PV testing lab CETIME and the solar thermal testing lab CTMCCV highlighted the state of the art of the certification and standardization of solar energy. The second session was dedicated to the presentation on PV module qualification/certification scheme according to IEC standards that was insured by a MED-DESIRE expert from ENEA.